A venue discretely nestled within the midst of the West Sussex countryside was our destination earlier this week to talk about all things motor racing with a team that has already seen countless National and European successes since its creation little over five years ago. If it hadn't have been for the presence of three gleaming white transporter lorries out in the front yard, it would have been very easy for us to simply drive straight past the new light industrial units that now form the new headquarters for Tom Ferrier's TF Sport motor racing empire. Having acquired these new premises at the end of last year, Ferrier soon added over our coffee that he was still looking forward to getting his entire stock and race cars and equipment into his new home for the first time as two race cars and two sets of equipment were still out and about on their world travels - one (due back imminently) was the AMR Vantage V12 GT3 entered into the Asian Le Mans Series for the first time with the Red River team and of course the other being the V8 Vantage GTE World Endurance Championship entry raced by the team the only five days before at Sebring. Within the immaculate workshop facility stood both the last and the latest line of racing machinery to come out of the Aston Martin Racing's Prodrive facility with two examples of the brand new 2019 V8 turbo charged Vantage GT3 in varying states of preparedness for the racing season ahead as well as two (both somewhat works in progress) examples of its predecessor - the multiple Championship winning V12 Vantage GT3 with which TF Sport have made their name. Nearest to the up and over door, and the very latest car to enter the TF family with the first 2019 V8 Vantage GT4 to be shipped out of the Prodrive factory to the team ready for the opening round of the British GT Championship at Oulton Park in about a months time. With two ordered pre-season, Ferrier was hopeful that their second GT4 would arrive within the next two weeks. Still relatively bleary eyed from their near two week racing adventure in Florida with both the preceding test and then the 1000miles of Sebring race itself a week later, Ferrier first joked about just how high the calorific overload of trackside dining in the States can be before going on talk about how the race actually went for them. Acknowledging a continued lack of pace within their V8 Vantage GTE due to an unaltered BoP (a problem also being shared by the AMR factory supported #98 car) he went on to explain just how well he thought their race strategy was going until Jonny Adam became a magnet for multiple other race cars to make contact with their race car before ultimately their rear defuser broke and effectively ended any chance of a favourable finish as the rains began to fall and the race ended behind the Safety Car. 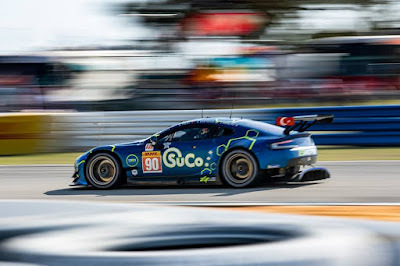 With the Championship now moving back towards Europe for both Spa and the season finale at Le Mans in June, Ferrier was still 'hopeful' that the performance imbalance between the AMR and certainly the Porsche's would be addressed by the governing bodies in time to make the the GTE Am Championship again a viable possibility for their long term customer Salih Yoluc as the available points still made that a possibility. Taking the conversation towards next years WEC, he confirmed that nothing had yet been confirmed with any potential customer for the 2019/20 season and with the entry window for next season (that now starts in September) still some months away it would be unlikely for anything to be confirmed for some time to come. With all the new race cars presently in the workshop all being prepared for the teams final pre British GT season test at Silverstone at the start of April, Ferrier confirmed the degree of expansion of running a double workload than previous years would have with on the team. Operating with less than half a dozen employees over the winter and away from the racetrack, last year saw them run with about 14 mechanic and engineers at the racetrack but for 2019 that number would rise to about 24 personnel to cover their four cars. The additional numbers would be made up from hired, seasonal labour and expertise from AMR and other racing partners. 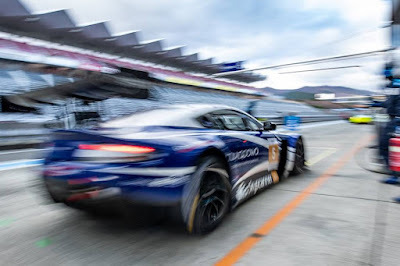 The decision to acquire a third Vantage GT3 chassis for the Oman Racing by TF Sport's Blancpain GT Series season was a logistical one that would allow the team to drop off and collect the relevant race cars 'on the way through' when the British GT and Blancpain GT Series featured back to back race weekends but also meaning that a car wouldn't have to be serviced/maintained/repaired in a race track garage without proper facilities and time being available. Other information on the teams Blancpain GT Series plans can be found HERE. Due to the workload currently being faced at the Prodrive factory in building and turning out large multiples of their new Vantage GT3 and GT4 race cars in time for the 2019 season, the teams pre season testing for British GT has not necessarily been at where Ferrier would have liked but the provision by the factory of their development GT4 car has at least allowed his four new young guns to become acquainted with the car. He still expects all four drivers to be testing at Silverstone from within the single GT4 presently available to him before his second car arrives just in time for the start of the season. It was certainly interesting to hear of his views about the unrestricted pre and mid season testing within the British GT teams, how much these tests were costing their paying drivers and the relevance of having an effectively unproductive (cost versus time on track) Media Day so early to the start of the season. The reasons for the team missing this years Championship's Media Day was a simple one of testing at the venue of the first race over the venue of a mid season race. He also commented on the sensibility of having the first race of the season on the narrowest circuit of the year with half a grid full of inexperienced GT racers when the weather was in theory at its worst! Asking about how he would fare with the required level of driver coaching and development within his team for his younger drivers, he did confirm that all had been accepted into the latest AMR Academy process with the factory with experienced driving personnel such as Charlie Eastwood and Andrew Watson also being on hand during the season to help all those within the paddock and registered with that programme. The team will also have the knowledge and experience of both Jonny Adam and Nicki Thiim to tap into as Adam pairs up with Graham Davidson for the first time and the Dane again supports Mark Farmer aboard his own new Vantage GT3. 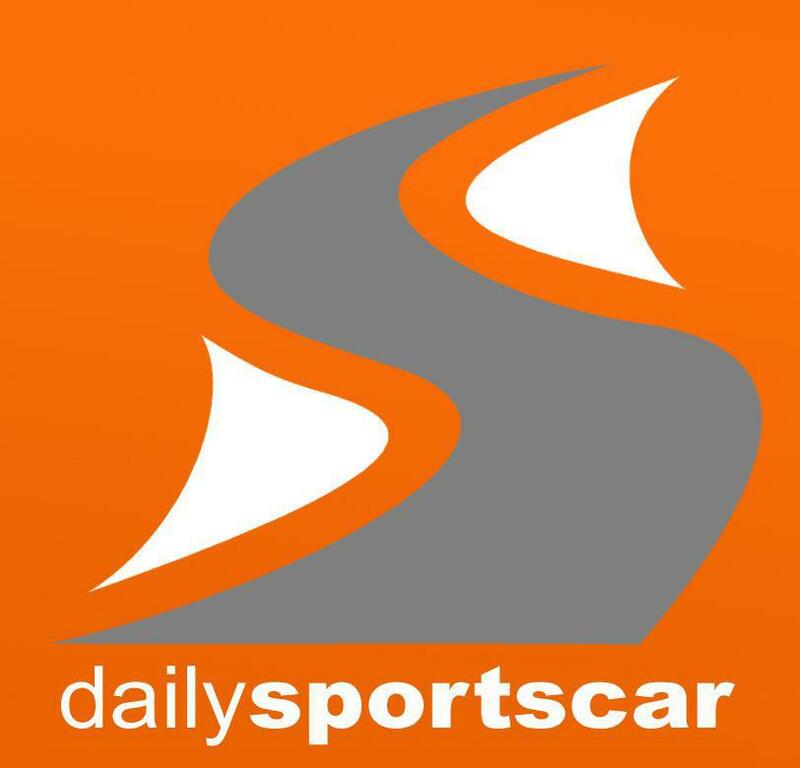 Not being the first team manager to tell us this before but there is could still be a possibility of the GT4 driver pairings already stated by the team changing again before the start of the season he seeks a balance between the characteristics of the four drivers and their sponsors that would give each an equal opportunity within the Championship as well as aesthetic liveries upon their cars. In terms of liveries for the British GT, all he would say was that blue would continue to be the base colour of choice for the team as well as the continued placement of hexagonal shapes around the body of the GT3's. The GT4's would run another base colour along with with their drivers own and championship's sponsorship logos. For the two V12 Vantages also in the workshop, it was still very much a 'work in progress' for both of them as the white and red #17 car of Derek Johnston was still in the progress of being rebuilt for possibly something a little different a little later in the year whilst the blue, former Mark Farmer car (written off in his start line accident at Spa last year) would be turned into a rolling pit stop training device for the team - once they find a little time to make the necessary adjustments! For the team, the new workshop gives them many increased facilities over the primitive ones of their former base - more workshop space (up to 7 race cars), a separate 'clean' room for those more complicated repairs, a meeting room, large ledges to collect and display their trophies and finally (and most importantly to Tom) - heating!!! Finally, what Ferrier really wants to replicate in 2019 are the reasons why three letters were sent to the team and now take pride of place upon the wall of the meeting room, each from the BRDC, David Richards of Prodrive and Dr Andy Palmer of Aston Martin Lagonda - all of whom personally wrote to him congratulating him and his team on their performances, professionalism, taking the brand forward in the racing area as well as by winning notable Championships. That kind of recognition always goes a long way in any working environment. 2019 is now just a few weeks away and we can't wait!